It was a pretty long drive the first day due to snow and almost took us 3 hours to get out of Vermont. Petunia went with us and she is such a good traveler. Even though the trip down was 9 hours. 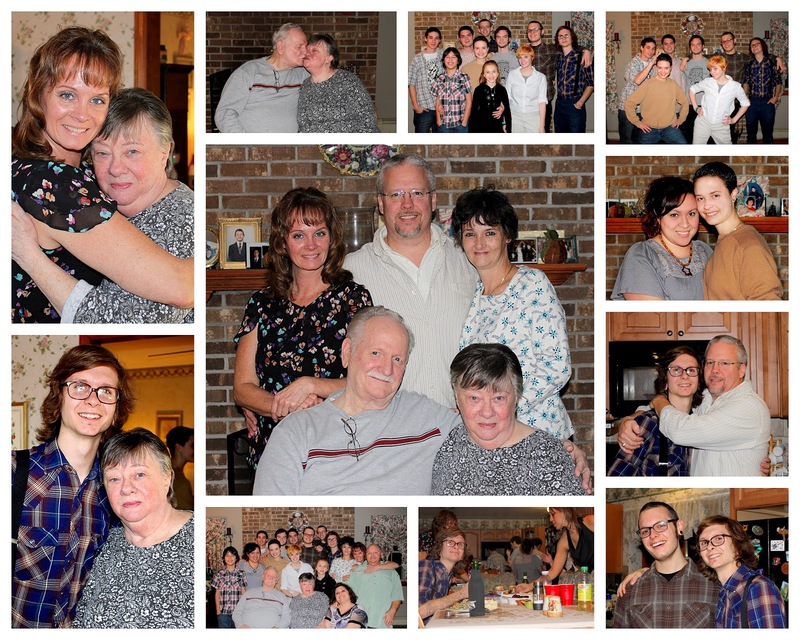 My family and I spent 5 days in New Jersey for Thanksgiving. The goodies you see above are from my wife's grandmother (we call her Mom-mom) We stopped by a couple times and went out to breakfast with her. Lots of pictures were taken on Thanksgiving day and the collage above were some of the highlights. Click on it to make it bigger. The middle picture is Of my father-in-law and his two sisters and his parents (we call them Pop-pop and Nanny) Dinner was amazing! I ate soooo much Turkey! I had 2 turkey sandwiches and another Turkey dinner in the following days! The weather was perfect in New Jersey. Of we were there with my wife's family, who are wonderful people, and I couldn't help but get homesick. But that's what happens when you move to the opposite coast that the rest of your family is on. 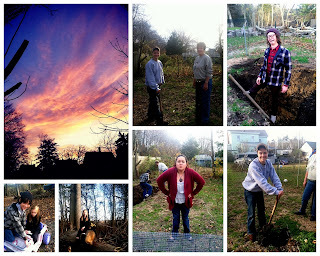 That colorful picture in the collage was one I captured when the sun was setting and they were all still digging. I helped fill the huge hole up. Another busy day was Friday. About 15 years ago my wife, her uncle and her brother buried a jar, like a time capsule type thing. They spent about 3 hours digging up Mom-mom's garden trying to find it. It was quite the entertainment for me. They weren't even sure if they were digging in the right spot! it was either 18 or 24 paces from were a swing use to be. The map was lost so they tried going by memory. So it looks like we will have a project for the next couple years! It was a great vacation, filled with family, love and food! Now it's time to gear up for Santa Claus! Even though we are Buddhist we still celebrate American traditions and long time celebrated winter festivities.